Are you ready to create a life and career you're crazy about? Stuck in overwhelm and confusion about your future? Surrounded by possibilities but uncertain of your direction? You are not alone. 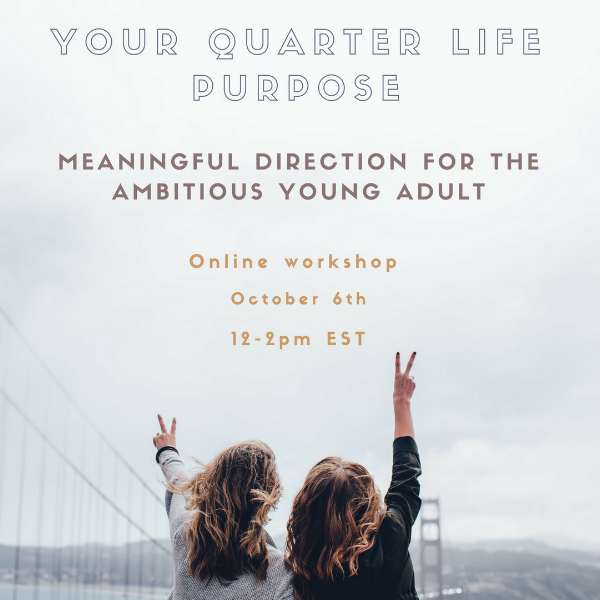 If you are 20 or 30 something- simultaneously feeling the excitement of what COULD be next, yet overwhelmed by the pressure to decide (what it feels like) the rest of your entire life- this online workshop could just be the thing for you. One thing you do know is that you want your life/career to have meaning and purpose. During this workshop, I will bring new ways for you to think about and take action during this defining juncture. My intention is that you're able to get out of your funk and into action again with a clearer, more meaningful direction and focus. The best bit: it’s all online. Once you sign up, I'll send you the private Zoom link so you can join from your very own home sofa with a mug of hot choc in one hand and your notebook in the other as we get down to moving your life forward. -Personal actionable steps you can start taking straight away! Ultimately, like many of us at this stage in life, that new found independence and opportunity that comes with the transition to adulthood can be quickly suppressed with anxiety, confusion and overwhelm. I want to help bring back that excitement you initially felt. -You're ready to get out of your own way and onto the path of building a life and career that truly matters to you. Stop feeling lost, overwhelmed and alone. Get supported and decide what's next with me! Like what you've read? Sign up to receive news and updates. Rachael Redgate is a Life and Leadership Coach based in England. She received her ACTP accredited training in New York from Accomplishment Coaching in 2014 and has worked with a range of clients from across the world since. She specialises in working with female graduates in their 20's who want a sense of direction and accountability with life goals. She helps them to live passionate lives with purpose-led careers. Don't think you're good enough? Stop trying to fix that and do this instead. Professional head shots by Paul Sunday.